Following the huge success of Paver’s ‘Chronicles of Ancient Darkness’ series which sold more than 2.5 million copies worldwide, Gods and Warriors is proceeded by high expectations. This is the first volume in a five-part series. Set in the turbulent Mediterranean Bronze Age, Hylad, the lowliest goatherd and an Outsider, is being hunted by a mysterious clan, the Crows. What they want with him, he doesn’t know, but his sister Issi has gone missing, his dog has been killed and the Crows are hot on his path. As Hylas runs for his life he is helped by his best friend Telamon, the chieftain’s son; Pirra, daughter of the High Priestess; and perhaps least surprisingly, the animals with whom he communicates. The story is set in an age when spirits, gods and magic were as real as the chasm between rich and poor. While the plot courses on suspense and adventure, the vividly-described world is steeped in detail, both historic and imagined. To spend an hour with Michelle Paver is to lose yourself in another place and another time. The relationship between Hylas and Pirra is interestingly played out: full of anger and prejudice, but with each character overcoming his weaknesses to become heroic. 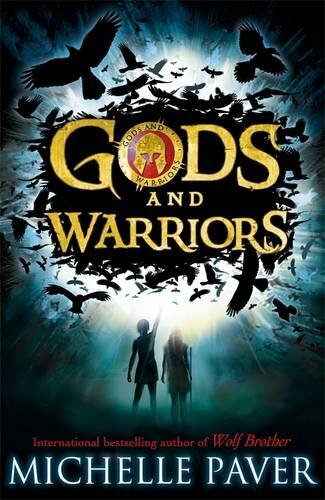 Appealing to both girls and boys, Gods and Warriors looks set to become another children’s classic.